If you’re in Central America searching for a place to wet your whistle this St. Patrick’s Day, look no further. Here are six Irish bars in Central America to celebrate in. Are you in Central America looking for a place to tie one on and celebrate today? If you’re Irish, you might well be. Today is St. Patrick’s Day, the celebration of all things Irish. Once upon a time, St. Paddy’s Day – and yes, it’s “Paddy’s” NOT “Patty’s”, as many Americans miscall it – was primarily a religious and cultural festival. Now, amid some consternation among many, it’s associated with drinking. We’ve spoken quite a lot about stereotypes here recently, and the devolvement of St. Patrick’s Day into a booze-fest because the Irish typically “like a drink or two” is something many Irish have mixed feelings about. It’s understandable. But the St. Patrick’s Day drinking tradition has historical roots, believe it or not. March 17th normally falls during Lent. Back in the day, Ireland observed Lent with fasting and no drinking. St. Patrick’s Day provided a one-day time out from that, a day when the church allowed you to let your hair down, eat something and have a pint. And so it snowballed from there. Nowadays everyone treats St. Patrick’s Day as a day to drink, no matter how tenuous their Irish roots might be. If you can’t beat them you might as well join them, right? So what do you do if you’re in Central America on St. Patrick’s Day? Central America doesn’t have a large Irish diaspora, unlike elsewhere in the world. It’s true many Irish came over to Latin America with the Spanish in colonial times and thrived. A man called Bernardo O’Higgins was the first ruler of an independent Chile. If people still used phone books, they’d see plenty of listings starting with O’ in Chile, Argentina, and elsewhere in South America. But not so much in Central America, which was always a backwater under the Spanish. No big Irish diaspora here. No Irish pub on every corner selling Guinness. We have a few though. Central America, like the rest of the world, didn’t escape the boom in Irish bars that exploded around the world over the past decade or more. 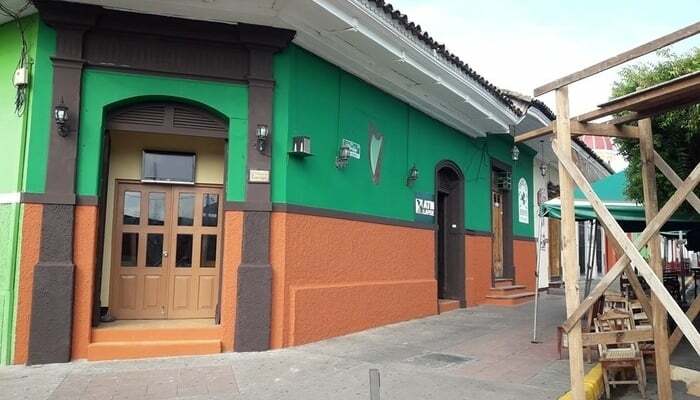 We’ll be the first to admit most Irish bars in Central America are not authentic, meaning ran by Irish people, but they can still provide a good time, especially on St. Paddy’s Day. So whether you’re as green-eyed and Irish as the River Shannon itself, whether you’re a plastic Paddy who thinks they’re Irish, or whether you have no connection with Ireland and just love the craic, here are seven Irish bars in Central America you can enjoy year-round. San Jose, Costa Rica has a real dearth of Irish pubs. A few have come and gone over the years, but Craic Irish Pub in the fashionable La Cali district endures. Note: This place is closed today. Their St. Paddy’s Day party was last night. But there’s always next year (or tomorrow). A genuine Irish bar started by a genuine Irishman, this place is now a major pitstop on Granada’s famous Calle La Calzada since it opened its doors in 2007. In recent years, O’Shea’s has also organised a St. Patrick’s Day parade in Granada, much to the supposed bemusement of local people. Are you looking for some craic in Panama City? If so, you’re luckier than most in Central America. You have The Blarney Stone on your doorstep on Calle 47. Get down there right now! Situated in the Zone Rosa, Republik offers live music most nights and a great party vibe like you were in Dublin’s Temple Bar district itself! One wouldn’t usually associate Tegucigalpa, Honduras, with anything remotely Irish. But McAllister’s has been getting rave reviews since it opened last year. They say the fish and chips here are to die for. The craic is alive and well at Reilly’s, one of Antigua’s most famous and popular watering holes. This place is legendary on the backpacking circuit and you’ll need a strong liver to endure it. By this stage you might have already started drinking by now. Maybe you’re in one of the Irish bars in Central America or maybe you’re creating your own craic somewhere else. Wherever you are and whatever you’re doing today, have a good one.